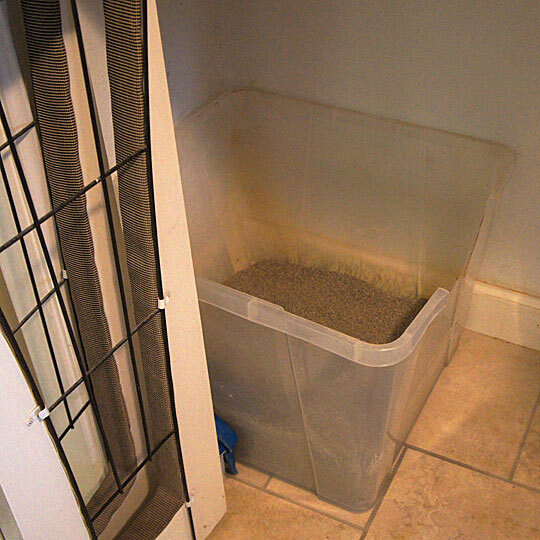 This entry was posted in Pets, Wordless Wednesday and tagged cat, Litter Box, Litter Box Solutions, Pet Products. Bookmark the permalink. What a great job. I have done the same thing in that I have used large lidless storage containers for my litter boxes but the sides are only about six inches tall, and I do have the same problem with my male cat. Mostly I would just like to keep most of the litter in the boxes because I have some athletic coverers who throw it everywhere. We don’t have a container store, but I would think I could find something on-line. Thanks for sharing. Yes the higher sides really do help, and would definitely help with those “athletic” litter tossers, lol! And I’m sure you are right that there must be someplace online that would sell a box with the taller sides. Bed, Bath & Beyond did sell some great colorful plastic containers, oval-shaped, with HANDLES that work well if you don’t need sides 14-16″ tall, but still fairly tall. They sell them for people as large plastic ice buckets, but they make beautiful litter boxes. Just a thought! Another great idea that looks pretty easy. I think manufacturer’s idea of fixing the problem are the hooded litter boxes. They have the slots on top, but that still doesn’t seem like it’s going to do much in terms of aerating the odor in there. We used to put our litter box in a really high cardboard box. Worked good for litter being thrown everywhere too. I agree, but then that kinda reminds me of the porta potty thing. Yuk…poor kitties!